Michael Brady begins his ninth season with the Blue Devils. He was promoted to Associate Head Coach in 2010 after serving as the top assistant coach for two seasons. An outstanding tactician, he has helped head coach John Kerr mentor numerous All-ACC and ACC Players of the Year during his time in Durham, including the 2011 M.A.C Hermann Trophy winner Andrew Wenger, 2014 ACC Midfielder of the Year Sean Davis and 2nd round MLS SuperDraft pick Zach Mathers. Brady helped mold Davis into one of the top center midfielders in the country in 2014. Davis, now a promising talent in Major League Soccer with the New York Red Bulls and playing quality minutes with the first team. The New Jersey native led the team and the ACC in assists in 2014 en route to earning Best XI recognition from Top Drawer Soccer. 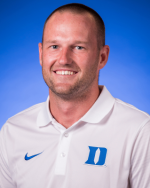 Chris Rich joined the Duke men's soccer staff as an assistant coach in May of 2015. Rich works closely with the goalkeepers as well as handling many scouting duties and also serves as the recruiting coordinator. He also is on the United Soccer Coaches National Staff and a Scout for U.S. Soccer. Rich, one year after landing a top recruiting class, spearheaded bringing in another top group with Top Drawer Soccer ranking the 2018 contingent as the sixth-best class nationally and features a host of players with youth national team experience.